Esqueleto Explosivo Slots is one-of-a-kind! The reels are filled with musical instrument playing skeletons, huge multipliers and more! Take a quick trip to Mexico today! Grab your sombrero and spin to win Esqueleto Explosivo Slots at Vegas Spins! Join the most colourful singing skeletons (each one has 3 skulls stacked on it! ), enjoy loads of generous multipliers, a 96% RTP and more! Watch out for the Pink Skeleton with a Rose in its mouth, which is the game’s highest multiplier, and get ready for a Mexican fiesta from the comfort of your home. 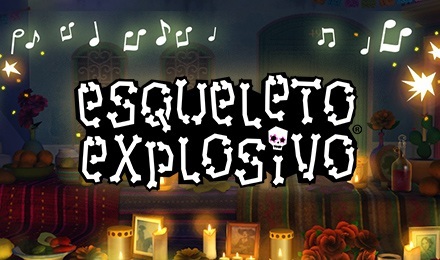 Login and play Esqueleto Explosivo Slots now! Good luck!